The Aberdeen City and Shire SDPA has responded to the Scottish Parliament's call for views on the Proposed National Planning Framework 3. However, two points of concern are identified for consideration by MSPs. The first of these weaknesses is that little consideration is given within the document to the implications of projected growth in terms of infrastructure. The second issue relates to the apparent prioritisation of high speed rail between Edinburgh and Glasgow ahead of existing infrastructure projects such as connectivity between Aberdeen and the central belt. This submission follows the Scottish Government's publication of the Proposed Framework on 14 January 2014. Four committees of the Scottish Parliament are considering the document during its 60 day period of parliamentary scrutiny. The National Planning Framework sets the context for development planning in Scotland and provides a framework for the spatial development of Scotland as a whole. It sets out the Governmentâ€™s development priorities over the next 20-30 years and identifies national developments which support the development strategy. 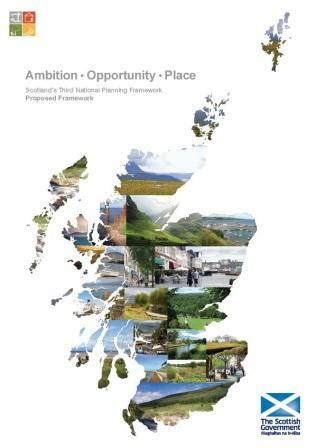 Following the period for parliamentary scrutiny and its report to the Scottish Government, the final National Planning Framework 3 is due to be published in June 2014.